The world's most advanced sign-making software for your vinyl cutting plotter that combines design features and vinyl cutting capabilities. The advanced design and layout tools will make your work easier and faster, vectorisation and contour cutting will push your possibilities to a new level. Both Windows and Mac versions available. Your total solution for designing, printing and cutting out artwork using a vinyl cutter/cutting plotter. 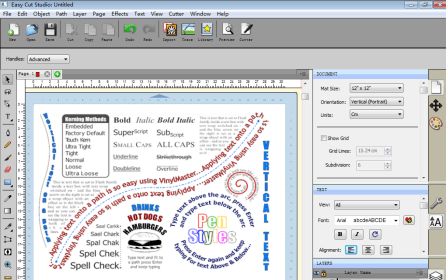 Easily Create text, shapes and freehand graphics at any size to cut in vinyl. 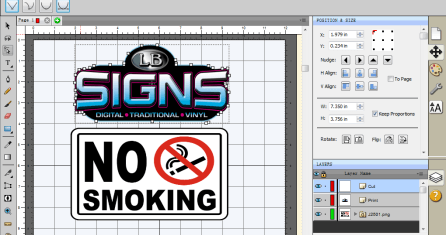 The software includes essential sign making tools such as image tracing, scanning, Inline, Outline, shadows, welding, text on arc, node editor, gradient fills, texture fills, transparent fills and much more. All popular cutting plotters are supported. Drawing and designing your artwork is so easy with excellent drawing tools, features and intuitive user interface. Type text, draw shapes, work with images and edit all of these with ease. Perfect for making your own signs, doing craft and hobby and much more! Working with Multiple Layers - easily manage and organize complex designs. A variety of shapes and tools. 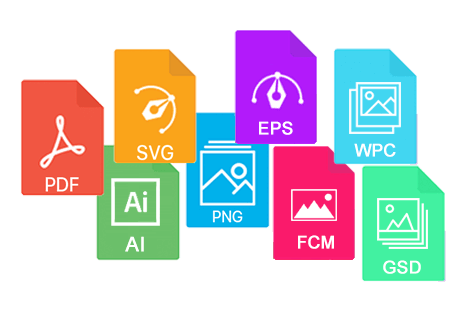 Import the most widely used vector image formats including SVG, EPS, PDF, GSD, AI, DXF, PNG, FCM, SCAL, SCUT, and WPC. The Pro version also supports the import DXF and PLT formats. Easily convert bitmap image to SVG vector suitable for cutting, All the major bitmap/image formats including BMP, GIF, JPG, JPEG, PNG, PSD, TIFF and TGA. If you need to convert PNG to SVG, look no further. 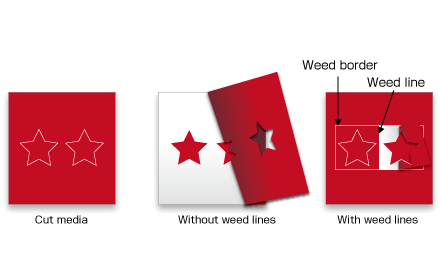 Support export your design to different formats, such as: SVG, BMP, JPG, PNG, FCM and TIFF. Simply the Best Auto-Tracer in the World. 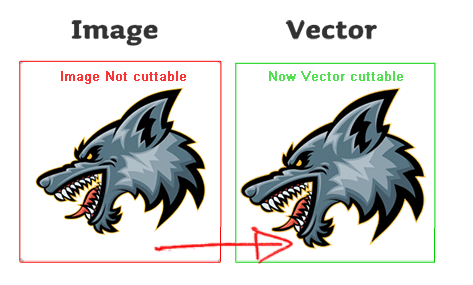 The vectorization is a specialist utility used to trace an image (bitmap) to create accurate vector paths ready for cutting. It does this by taking the image and tracing around its pixels to create an editable and perfectly scalable set of curves (paths) which can then be cut out with your vinyl cutting plotter. You can also scan directly from your scanner with the built-in TWAIN drivers. Layout and edit your text objects with all your fonts on your computer, make numerous powerful adjustments to your text add a lot of effects to your text like shadows, transformations, multi-outlines, stripes, 3D effects and many more..
Each type of text comes with a large selection of powerful tools and features usually only found in programs such asInDesign, CorelDRAW and MS Word. 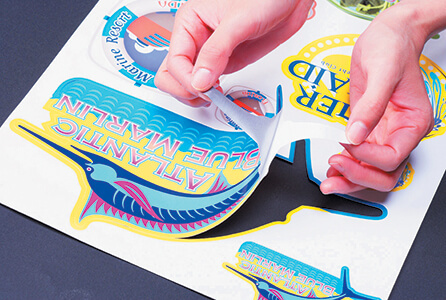 Coupled with the large suite of effects and layout tools this means you can design and produce an infinite range of professional decals, signs and posters etc. quickly and easily. 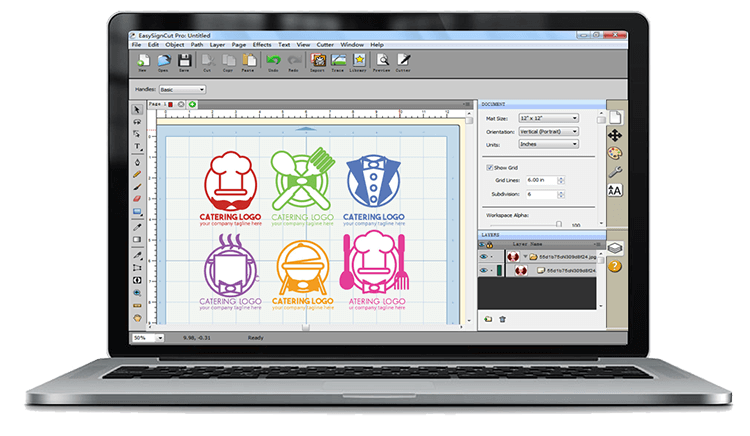 The software has the most advanced print and cut tools of any vinyl cutter software on the market for the most accurate contour cutting possible. Easily make decals, labels and stickers along with cutting shapes and lettering out of paper and card for craft, hobby, scrapbooking and even product box design and prototyping. 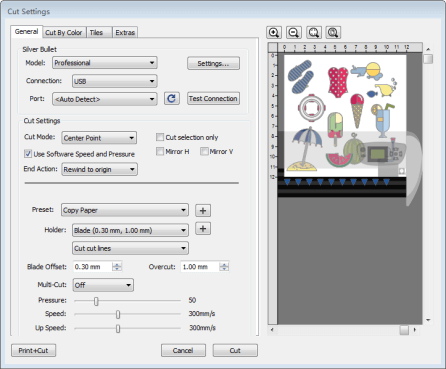 The software has the ability to set layers as “print-only” or “cut-only” for easier print and cut use. It also has customizable registration marks. Cut what you want and where you want with professional cutting tools such as auto-rotate, mirror, speed-weed and easy lift marks. Separate by color and add registration marks with one-click. Pro version also includes Tiling and Paneling for cutting over-wide and over-long artwork and allows you to set an automatic overlap and even equalize the tiles. 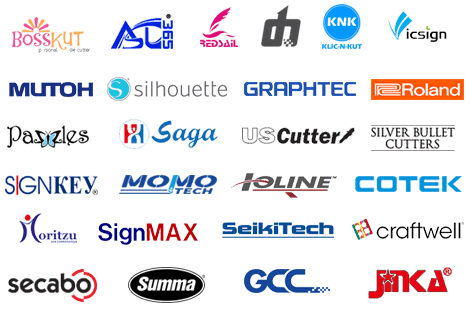 Supports over 500 vinyl cutters including all the popular brands including: BlackCat, BossKut Gazelle, Copam, Cotek, CraftRobo, Craftwell eCraft, Creation, Foison, GCC, GoldCut, Graphtec, HobbyCut, i-Craft, Ioline, Jinka, Rabbit, KingCut, KNK, Liyu, Lynx, Pazzles Inspiration/Pro/Vue, PCut, PowerCut, Rabbit, Redsail, Refine, Roland, Saga, Secabo, Seiki, Signpal, Silhouette SD/CAMEO/Curio/Portrait, Silver Bullet, SkyCut, Summa, Titan, USCutter, Vevor, Vicsign, Vinyl Express, and hunderds more makes and thousands of models. It is more meant for businesses that use the larger vinyl plotters. One solution for all your print, cut and design needs. The cutting object can be split into smaller tiles. 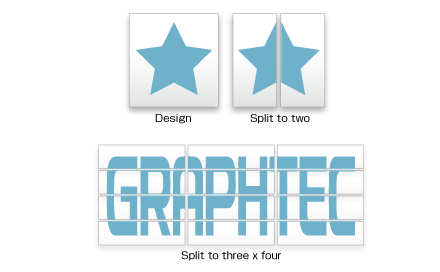 When the object needs to be placed to the surface made by multiple panels or is larger than the width of the media, the object can be split to size for fit it. With EasyCut you don't have to put out copies of your design in your design software. 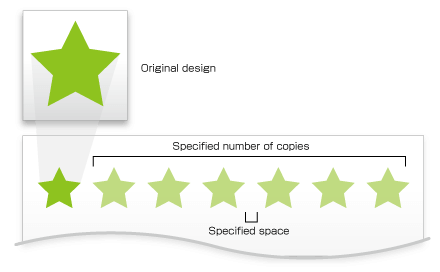 You can use our copies feature and EasyCut will cut out as many copies as you specify on your material. The border line and weeding lines can be added around the cutting object automatically and then it is cut. It makes easier to remove the excess material from the media. The ability to assign a layer to cut with every color and be used for alignment. 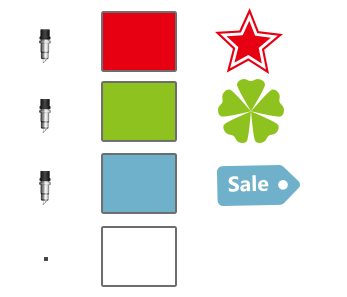 allow you to choose which colors in your design you wish to cut, and choose whether you want to Cut all Colors in a single job or Cut each color separately as a separate job. "Just wanted to let everyone know that I recently purchased EasyCut software and it is working perfectly with my USCutter MH 871-MK2 cutter on macOS. Easy to setup and use!" "This is the most amazing software ever for cutting machines. The cut paths it generates are more accurate than other cutting software I’ve used and I rarely have to clean them up after, even with complex shapes." "I just love this program, Everything is intuitive and it gets the job done. worth the money it coast, a lot cheaper then having to purchase other vinyl cutter software out there to go with my Roland cutter." To fully test and experience EasyCut and EasyCut Pro just hit the download button below and install the free trial today. © 2019 SoftwareforCutter.com. All rights reserved.